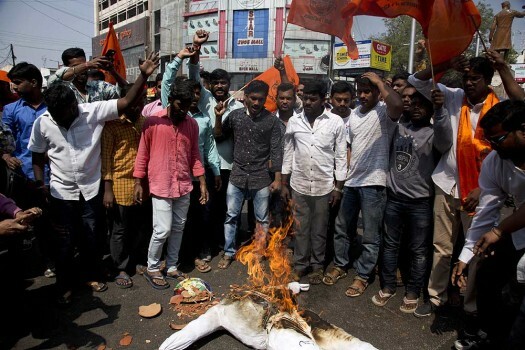 Activists of India's right-winged Bajrang Dal shout slogans as they prepare to burn an effigy symbolizing Valentine's Day during a protest in Hyderabad. AP Photo /Mahesh Kumar A. 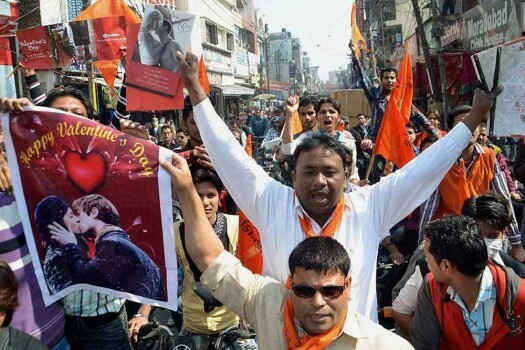 Activists of Bajrang Dal burn an effigy symbolizing the Valentine's Day during a protest in Hyderabad. 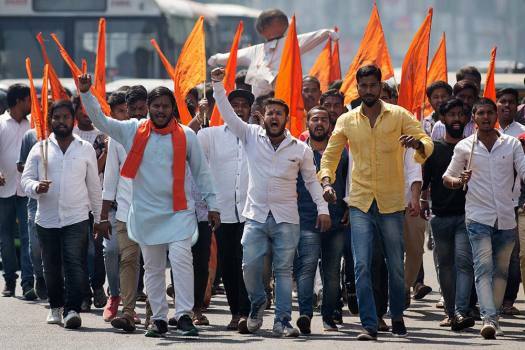 Bajrang Dal activists protesting against filmmaker Sanjay Leela Bhansali's upcoming film "Padmavati" in Nagpur, Maharashtra. 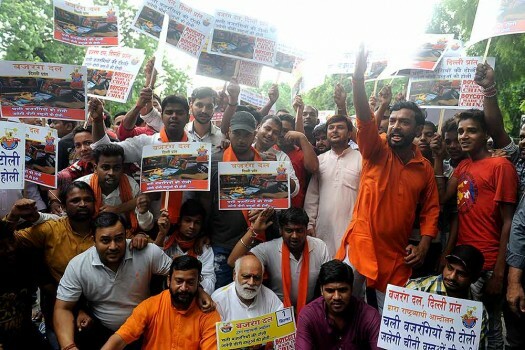 Activists of Vishwa Hindu Parishad and Bajrang Dal shout slogans during a protest against Chinese products at Jantar Mantar, in New Delhi. 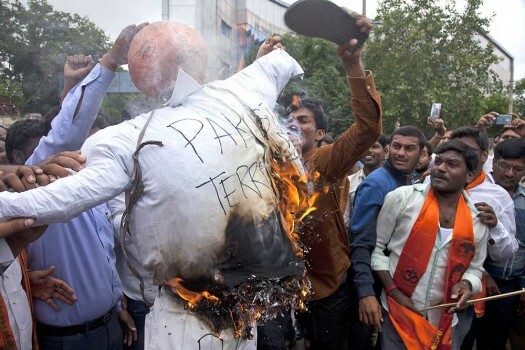 Bajrang Dal activists burn an effigy symbolizing Pakistan and terrorism against the gunfire attack on a bus carrying pilgrims, in Hyderabad. 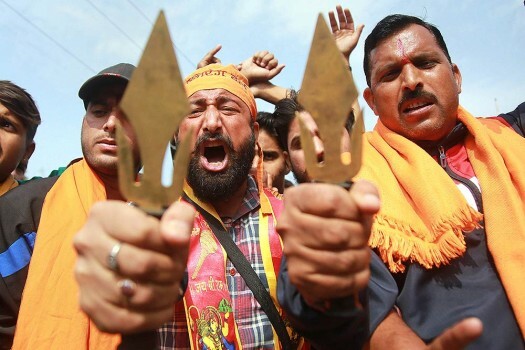 Activists of Bajrang Dal displaying a trident following a bandh call in response against the yesterday's militant attack on pilgrims, in Jammu. 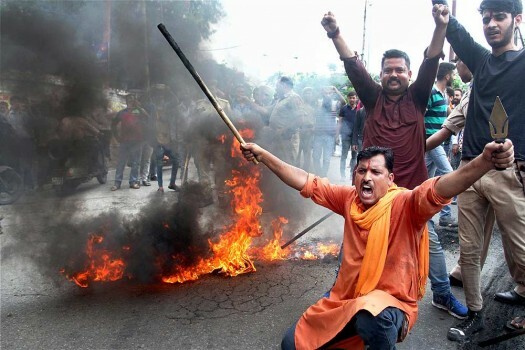 Activists of Bajrang Dal burning the tyres and blocking a road following a bandh call in response against the yesterday's militant attack on pilgrims, in Jammu. 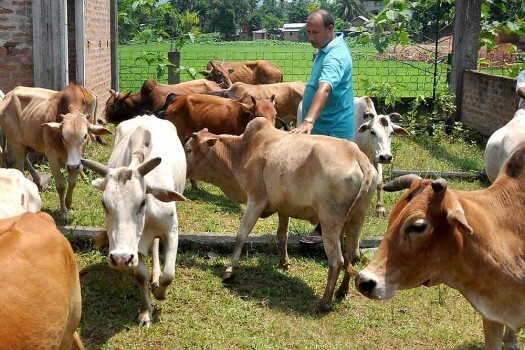 Cows seized by Bajrang Dal activists from being allegedly illegal transporters at Sonapur on the outskirts of Guwahati. 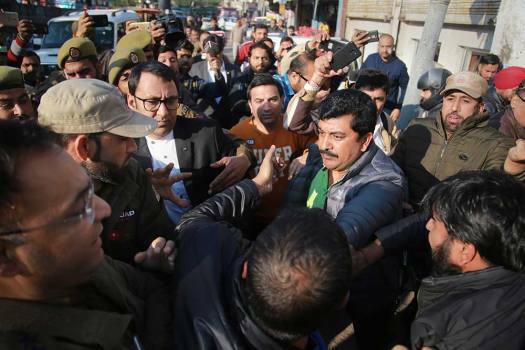 A Bajrang Dal activist protesting with a flag during burning of an effigy of former J&K chief minister Omar Abdullah in Jammu. 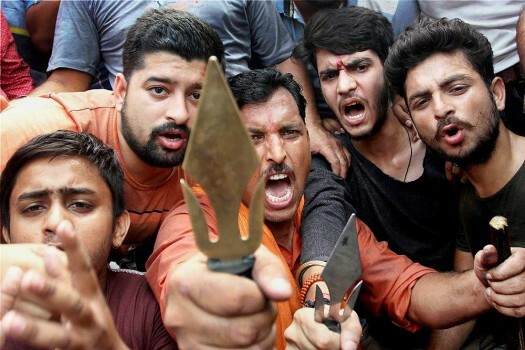 Supporters of Bajrang Dal protest in New Delhi against stonepelters and Pakistan attacks on Armed Forces in Jammu & Kashmir. 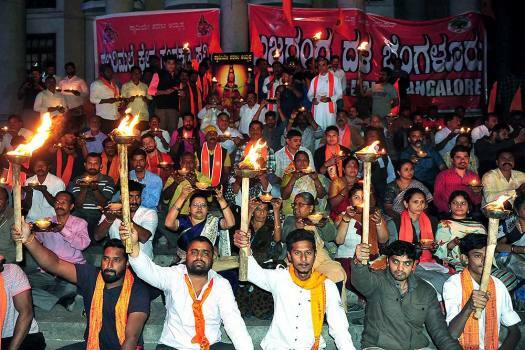 Supporters of Bajrang Dal protest in New Delhi against stonepelters and Pakistan attacks on Armed Forces in Kashmir. 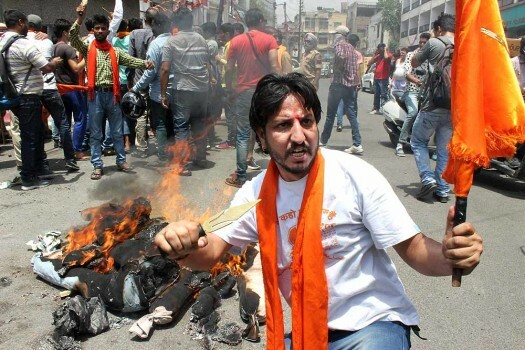 Bajrang Dal activists participate in their camp in Noida. 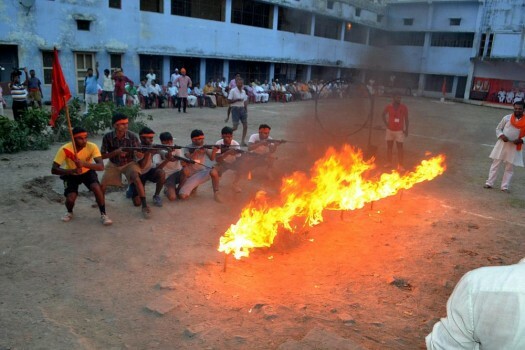 Volunteers at a self-defence training camp organised recently by Bajrang Dal in Ayodhya, Uttar Pradesh. 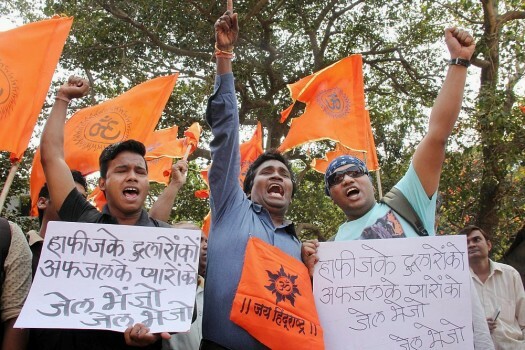 Bajrang Dal activists staging a protest against alleged anti-national activities at JNU at Azad Maidan in Mumbai. 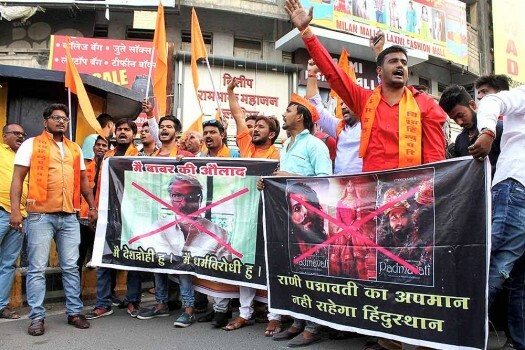 Bajrang Dal activists burn posters during a protest against screening of the film 'PK', in Jaipur. After the tough Gujarat polls and ­Rajasthan drubbing, in the duo’s last mile dash, Modicare, MSP, even DeMo will all be ammunition to snipe at the Congress’s scam skeletons. 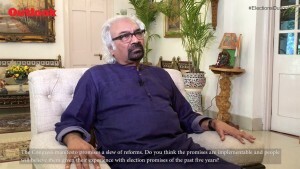 But BJP insiders agree it is not an easy task. In her suicide note, she wrote that a group of five harassed her and her mother by alleging that she goes out with a Muslim boy. A group of Catholic carol singers were detained by police a few days ago in Madhya Pardesh's Satna after extreme right wing Hindu groups alleged religious conversions. A priest’s car was set on fire allegedly by the groups. The group was at the police station till midnight. Bajrang Dal to observe 'Shaurya Diwas' (Day of Valour) while Muslim organisations plan 'Yaum e Gham' (Day of sorrow) to mark the day. Later on the police intervened into the matter and took the girl and the boy to a police station.